Tank Shop’s Modline Steel Tanks are a great choice for tight spaces. Their flat ends give them a modern look and a smaller footprint than similar slimline tanks. 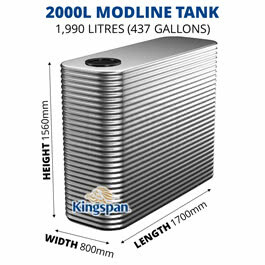 Made from BlueScope’s AQUAPLATE® steel, a modern steel purposefully fabricated to hold drinking water, our modline tanks can store rainwater from 750L (170 GAL) up to 7,400L (1,625 GAL).